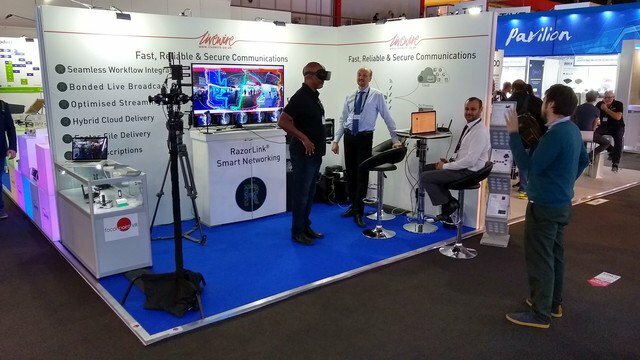 SETsquared Surrey member Livewire Digital partnered with Focal Point VR at iconic media and technology show IBC 2018 to showcase their combined technology delivering live, professional 360° video content to social media. The 8K video was streamed over Livewire Digital’s newly launched SilverBlade II – a highly resilient system that provides an internet connection. The RazorLink® Smart Networking technology in SilverBlade II can provide the fast and reliable Internet connectivity necessary to deliver the content from the field where no fixed infrastructure exists. By bonding and optimising multiple cellular, Wi-Fi and satellite services, RazorLink offers a transparent connection with the performance and quality of service necessary to support the live streaming of very high resolution professional content. Fully immersive 360° video will change the way the public views sports, news and special events, allowing them to be fully immersed within the action. Combined with augmented and virtual reality live stream, VR video will also offer a new dimension to education and the monetisation of content. Jonathan Newth, Focal Point VR’s CEO, said “The ability of VR Video to ‘teleport’ the media consumer to another place live represents an entirely new paradigm for video. We are really excited to be working with Livewire Digital to enable live VR video streams from virtually anywhere”.